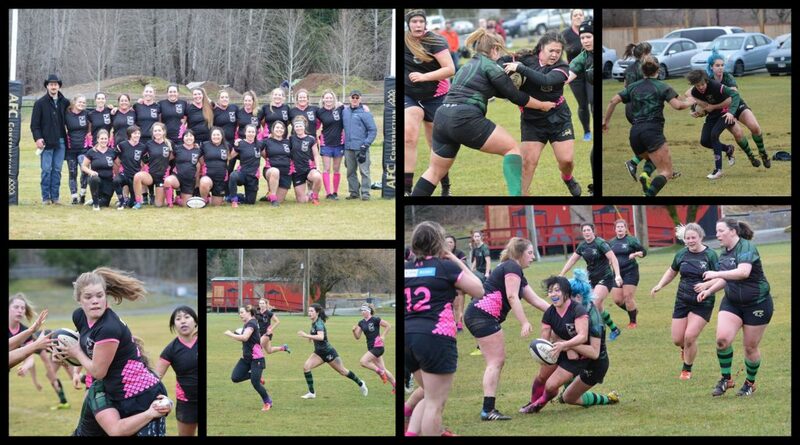 This past Saturday, the Comox Valley Kickers Women’s Team hosted Cow/West, a combined side from Cowichan and Westshore at Cumberland Village Park and earned a 33-10 win to start the second half of the rugby season off strong. Fittingly enough, the Kickers kicked off to start the game. It was a very competitive game with a lot of back and forth action. Comox’s first try came from Outside Centre Daris Tendler, who managed to sprint and deke her way around the several defenders. Utilizing her speed, Daris had a dominating game scoring 4 tries in total with Winger Michelle Hamilton adding 1 try to the scoreboard. Flyhalf Paula Simpson kicked four successful conversions. “We are coming back from a two-month break and we look like a different squad. There are lots of new faces on our team for this half. I wasn’t sure how the first game back would go, but all the ladies stepped up and played hard,” said Kickers Captain Natalie Nguyen. The after-game festivities continued at the Cumberland Hotel, the Kickers Sponsor Bar & Clubhouse. The Women’s team have a bye next week. The Comox Valley Kickers Men’s team will host the UVic Saxons in their season opener on Saturday, February 2nd, kickoff at 1:00PM at Cumberland Village Park. Both teams are still recruiting players for the season. No experience needed. We practice at Cumberland Village Park on Tuesdays and Thursdays from 6:30PM to 8:00PM.